Who doesn’t love going to an old school roadside American diner? A tiny jukebox mounted in every turquoise vinyl booth, miles of white, gold-flecked Formica, and a huge, ten-page menu printed in ten-point type with so many options you have to wonder if their walk-in refrigerator is bigger than the kitchen. But let’s face it, most of us won’t look at every single option that’s on the menu searching for something that will satisfy the exact craving we have at that exact moment. Usually, we’re too hungry or in too much of a hurry or just jump to the old, tried and true choice even if it’s not exactly what we’re looking for. A lot of servers will tell you that regular customers usually only order one of a small handful of favorites and rarely try anything new. I’m willing to bet most people tend to use PowerPoint this way. We open it up, use the same handful of tools, commands, and functions to make slides and sometimes settle for something that isn’t exactly what we wanted; something that doesn’t quite completely satisfy. If this sounds familiar, I suggest that you set aside some time, open up a copy of an old PowerPoint file, and slowly peruse each of the menus, trying out each item that you’re not particularly familiar with. Expand your PowerPoint palate in other words. 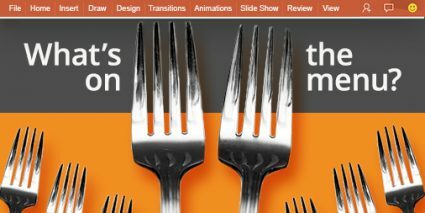 I’m certain you will find yourself saying, “wow, that’s great” or “I didn’t know PowerPoint could do that!” And even if none of what you see and try makes it into your usual PowerPoint diet, you’ll now know exactly where to go when it’s late at night and you have a craving for one of the exotic new items you discovered. Finding a quick, easy workaround for a problem can get you out of a jam. Just be sure to go back and find a more suitable long-term solution before the quick workaround becomes its own problem. 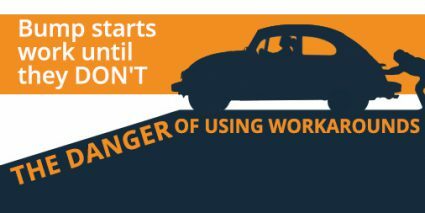 My first car and its wonky starter is the perfect example of this principle. It was a 1968 Volkswagen Beetle, generally blue in a splotchy, patchwork sort of way. Its hippie years were long behind it but I loved it dearly. At some point the “bug’s” starter went bad, so turning the key no longer started the engine. Being 17, all my extra cash and spare time was earmarked for far more import things so I adapted and made do because I still had places I needed to go and things I needed to do. My workaround isn’t used much these day because it requires a manual transmission. It’s called bump starting and it’s actually fairly simple. Get the car rolling at a reasonable clip, usually by taking advantage of a reasonably steep hill or a bunch of burly friends, and pop the clutch while in first gear. There will be a bit of a jolt (a bump if you will), the engine will turn over and catch just as if you had a functioning starter. I was pretty pleased with this workaround. It was cheap, it didn’t involve wasting a lot of time getting the car into the shop, and it was kind of fun. I just needed to make sure I parked on a hill or near a bunch of people willing to give me a push. Bump starting worked very well until it didn’t. It stopped working for me on a rainy day out in the middle of nowhere. I was stuck at the bottom of a short, steep hill because I hadn’t been able pop the clutch with just the right timing. I was already late for my shift at work and miles from a pay phone. Long story short, I had a long, wet walk, I almost lost the job and I needed to ask the parents for a ride (just what every 17-year-old with his own car loves to do). Using the bump start workaround was great for getting me through the period immediately after the starter failed. My big mistake was letting it become a long-term strategy. I have seen this same sort of thinking cause serious problems with a number of presentations. For example, when your calendar is packed solid, it’s tempting to wait until you’re on the plane to work on the presentation. This works for you once, then again, and then it becomes standard operating procedure until it causes the inevitable disaster. The same principle applies when you are actually working on slides. For instance, how many times have you quickly applied an underline to a less than sign to make it into a less than or equal to sign instead of taking the time to insert the correct character? Works great until the slide is moved to another presentation or the master gets reapplied and all that underlining goes away (a disappearance that often goes unnoticed until it’s too late). The bottom line is that short-term workarounds can get you through a pinch but just make sure that you don’t let them become the long-term way of doing things. Find real solutions that don’t leave you at the bottom of the hill, in the rain about to lose your job. 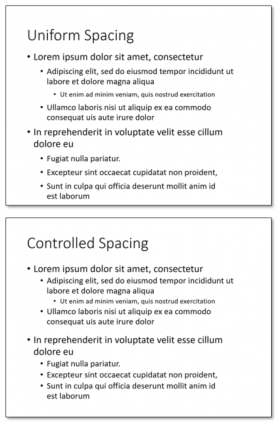 Controlling space is one of easiest and most effective ways you have of making your slides easier to read and comprehend. For instance, the default settings in older versions of PowerPoint created bullet points that all had an equal amount of space between them no matter if they were top-level bullets points or sub-bullets. Indenting and the increasing smaller font size gave some clues as to what was important and what went with what, but the uniform spacing could make it more difficult for the audience to see what the slide was trying to do. To put it simply, elements that belong together conceptually, should be close to each other spatially and elements that are not related conceptually should be distanced from each other. This technique doesn’t just apply to text spacing. Does the chart or table on your slide have its own title? Is this title closer to the chart or to the slide’s title above it (or is just hanging there somewhere in between?). Positioning the title closer to its chart makes it immediately clear to your audience that they belong together as a unit. Now if the text above the chart is just a bullet point or two, you will want more space between it and the chart so it’s clear they are separate elements. 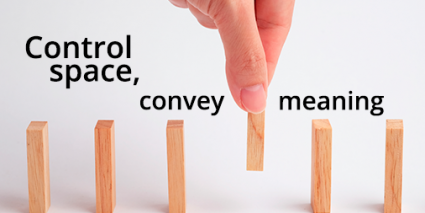 Remember, space conveys meaning and small changes like these can make a big difference. Have you ever lost a slide or a presentation? Tell us about it and you could win! Let’s be honest. If you’ve spent any time at all working with PowerPoint, you know what it’s like to misplace a really important slide or presentation. Sometimes you can’t remember where you saved it. Sometimes you lost the thumb drive it was saved on. Sometimes you have the file but the slide you need was deleted or changed beyond recognition and you don’t have a backup. Losing slides may be one of life’s universal experiences but each lost slide story is unique and we really want to hear yours. 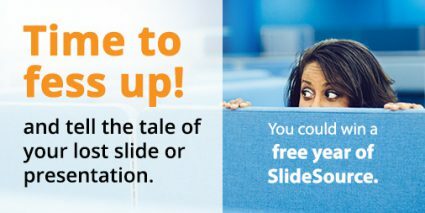 Share your lost slide tale of woe with us and we’ll enter you to win a free year of SlideSource ($216 value). We’ll also post our favorite stories on our blog so at least you may be able to salvage some minor internet fame from the whole unfortunate episode (we promise we wont reveal your identity). You can submit your story and enter our prize drawing here. 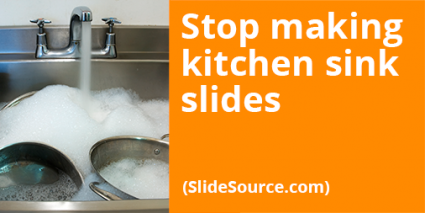 Are you washing dishes with that PowerPoint deck? Then you don’t need to include the kitchen sink. There seems to an ingrained human instinct to fill slide files with lots of stuff. Stuff that might not really be needed but is thrown in anyway, just in case. In other words, kitchen sink slides. Maybe it’s a third option that needs to be added to the proverbial fight or flight stress responses. It’s a perfectly understandable response that can be necessary and useful when you are initially drafting a presentation. Just make sure that before you actually use the deck, you define exactly what the presentation needs to accomplish and ruthlessly remove every slide that doesn’t make a definite contribution by moving it closer to that goal.